Human growth hormone is responsible for growth and regeneration among humans and also stimulates cell reproduction. However, deficiency of growth hormone is constantly on the rise. Advancements in technology including development of recombinant human growth hormone by the major players is boosting the market growth. Also, the leading companies are focusing on increasing their production capacity in order to increase supply in the rural areas. As per the latest report by Transparency Market Research (TMR), the global market for human growth hormone is likely to see strong growth in the coming years. The market is estimated to increase to 6.2% CAGR. The global market for human growth hormone is also estimated to generate US$ 5,261.5 million revenue by 2026 end. Among various route of administration, subcutaneous as the route of administration is likely to witness substantial growth between 2017 and 2026. Subcutaneous as the route of administration is estimated to surpass US$ 1,600 million revenue by 2026 end. The preference for the subcutaneous method is increasing as it leads to the significant rise in growth rates and low incidence of antibody development. Moreover, subcutaneous route is highly preferred for chronic growth hormone therapy. Compared to the various distribution channels, hospital pharmacy is likely to emerge as one of the largest distribution channels. By the end of the forecast period, hospital pharmacy is projected to bring in close to US$ 2,200 million revenue. Owing to the high cost of human growth hormone drugs, a lot of hospital pharmacies are distributing drugs. Also, high investment for development of advanced healthcare centers and hospitals by governments in various countries is also driving the distribution of growth hormone drugs through hospital pharmacy. Growth hormone deficiency is likely to account for the largest market share in terms of value. Towards the end of 2026, growth hormone deficiency is estimated to create an incremental opportunity of more than US$ 1,100 million between 2017 and 2026. Pituitary tumors, metabolic abnormalities, and skeletal abnormalities are some of the factors resulting in the rise of growth hormone deficiency. Adults with growth hormone deficiency are also increasingly taking growth hormone injections as it protects them from increased muscle mass, fractures, and also reduces the risk of heart diseases. North America is likely to emerge as the largest region between 2017 and 2026. Presence of the major market players and commercialization of growth hormone by the U.S. Food and Drugs Administration (FDA) are driving the market growth. Meanwhile, Asia Pacific Excluding Japan (APEJ) is also expected to witness the fastest growth in the coming years. India, China, and Australia are contributing towards the growth in the region. Moreover, increasing number of people suffering from growth hormone deficiency also presents an opportunity for the leading companies in APEJ region. Merck KGaA, Pfizer Inc., Eli Lilly and Company, Novartis AG, Novo Nordisk A/S, Anhui Anke Biotechnology (Group) Co., Ltd, Biopartners GmbH, Ipsen S.A, GeneScience Pharmaceuticals Co., Ltd., and Roche Holdings, Inc., are some of the major companies operating in the global market for human growth hormone. Growth hormone deficiency affects both adults and children. The market for human growth hormone is anticipated to have significant growth in the near future. Increasing investment by key players in the research activities and increasing awareness about the importance of growth hormone are major factors driving the market growth. Growth hormone is a small protein that acts on various tissues in the human body and also boosts protein production. A lot of research activities are being conducted on growth hormone and how it can be used to reverse various health problems. Among various biological effects, injecting growth hormone has been found to decrease body fat and increase muscle mass. Many key market players are entering into joint ventures, and mergers and acquisitions to conduct research and development activities in order to launch new products and expand globally. 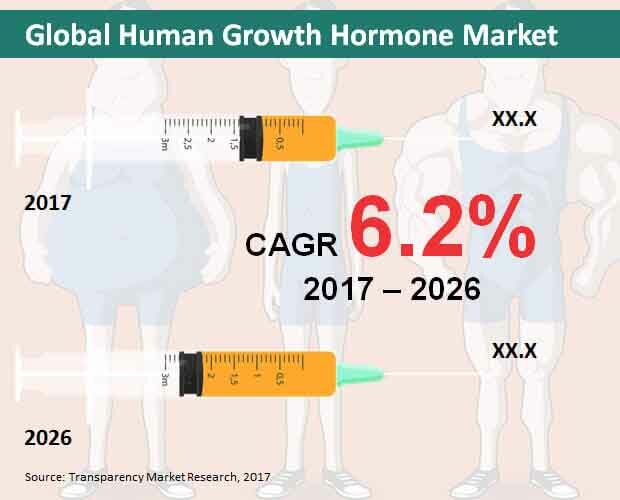 A strategic study of the global human growth hormone market and forecast for the period 2017-2026 has been provided in the report. Market research experts Transparency Market Research conducted a comprehensive research approach including qualitative and quantitative research methods. This has been done to analyze various factors such as demand in the market, key developments, technological innovation, and services provided. In order to forecast market growth globally, primary and secondary research was also done. Primary research included interviews with market experts, here, the information provided by respondents was verified using various data sources. Annual reports, investor presentation, and financial reports formed the part of the secondary research. The report on the global human growth hormone also identifies the prominent market drivers, key trends, opportunities for the growth in the market and obstacles or challenges. The report also includes a comprehensive analysis of factors impacting the growth of the market along with Porter’s five force analysis, market attractiveness analysis and SWOT analysis. The report also offers market revenue, along with the CAGR, year-on-year growth for the forecast period 2017-2026. The report also offers a thorough analysis of the key players and competitive market landscape. Company overview, product portfolio, new developments, and unique business strategies adopted by the key companies are also provided in the report. The information on companies provided in the report allows a better understanding of the market and helps in planning strategies to compete in the market. The global human growth hormone is segmented on the basis of route of administration, distribution channel, indication, and region. In terms of route of administration, the market is segmented into intravenous, subcutaneous, intramuscular, and oral. On the basis of distribution channel, the market is divided into hospital pharmacy, retail pharmacy, online pharmacy, and clinics. By indication, the market segment includes growth hormone deficiency, turner syndrome, idiopathic short stature, prader-willi syndrome, and other indications. Geographical segmentation of the global human growth hormone market includes Latin America, Asia Pacific Excluding Japan (APEJ), North America, Japan, Europe, and the Middle East and Africa (MEA). Some of the key players in the global human growth hormone market are Pfizer Inc., Merck KGaA, Eli Lilly and Company, Novo Nordisk A/S, Novartis AG, Anhui Anke Biotechnology (Group) Co., Ltd, Ipsen S.A., Roche Holdings, Inc., Biopartners GmbH, and GeneScience Pharmaceuticals Co., Ltd.